Colin Kaepernick trotted out onto the Superdome carpet with about a minute to play after the Saints took the lead, preparing for a last possession to try and pull the game out for the 49’ers. Fans commenced their collective roars. Sean Payton flailed his arms upward from the sidelines, having no reservation whatsoever in exhorting them to let it all hang out. Yet all crowd shrieks are not the same. The tenor for the home team can be laced with fear, as in …hold on! But this barrage had none of that, it having the baritone of a coliseum scene from Russell Crowe’s cinema classic, Gladiator. Kill ‘em! Now! Do It! When it comes to defensive stands for the Post Katrina era Saints, the tone of the latter has been far and few between, this reminiscent of the blood thirst emanating from the stands a quarter of a century ago, when the likes of Rickey Jackson, Pat Swilling, Vaughn Johnson, Jim Wilks, Frank Warren et al made life miserable for visiting offenses on Poydras Street. Kaepernick was tossed around like a rag doll in being sacked twice, and had no shot. Game Over. Defensively, on this day at least, the Saints had come Back To The Future. The Saints will be on the receiving end of plenty of shrieks up in Seattle next Monday night on prime time. Whether those will be fueled by booze or latte is anybody’s guess. The noise decibels will resemble multiple Boeing 747’s at takeoff. Though it is an outdoor stadium, almost accidentally it seems, it’s the loudest in the league. But the explanation for much of the noise may simply be a release of mass malaise, in a place where it drizzles and rains most calendar days every year. It will be bedlam. They kick off the proceedings with their 12th Man tradition, and though stolen from Texas A & M University, it upstages that at College Station. A guest of the Seahawks will pull on the rope of a large bell up in the end zone, after which the place will proceed to go bonkers for the next several hours. The last time the Saints were in Seattle was bitter, in a playoff opener as defending champs in January of 2011. As double digit favorites over a measly tournament entrant, the team just skidded around up there, made a mess, and though ended up scoring in the thirties, lost. On this page, imagery used afterwards was that of the RMS Titanic, hitting an iceberg in the Great Northwest, leaks sprung everywhere, and everyone having to paddle home. Head coach Pete Carroll brought the college atmosphere from USC up to Seattle in his first, that season there. Surprisingly, in a pro league that tires of rah rah, largely due to the conundrum of business and marathon seasons, it has worked ever since. His coaching philosophy? It’s simple. Energy, energy, and more energy, and spare me the details. He can be amusing in that respect. Last year, when the replacement refs blew a call on an end zone catch that robbed the Packers of a win, Carroll sprinted to the end zone and lobbied them like a street hustler in New York City, a subtle smile besmirched on his face, knowing full well all along that the call that gave his team the victory was bogus. The Seahawks are the fashionable pick to represent the NFC in the Super Bowl because they a) have a strong team and b) an opponent would have to advance thru the vehement venue of the 12th Man to do so. Seattle hasn’t lost at home in 2 years. San Francisco’s defense was burly, Seattle’s is faster. Though Darren Sproles is needed back for this game, the Saints aren’t really going to outrun them. Besides some persistence in just running straight at them in the hope they can occasionally crack open a seam, Sean Payton’s offensive game plan hopefully utilizes every inch of ground on their field, and spreads it long and wide. He’s good at that. Some misdirection, in either running or cross field passing, might eventually tire the ‘Hawks, as would monotonous, clock consuming drives. Throw deep a couple of times early, just to get them thinking more and reacting less, which is when they are deadly. Their cornerback in dreadlocks, Richard Sherman (#25), besides being Stanford educated and a cartoonish character, is probably the best at his position in the NFL. Tall, swift, rangy, and physical, Spider Man spins webs around receivers. It will be interesting when he is matched up with Marques Colston. Because of the speed of their linebackers, and that they will likely overload on him, Jimmy Graham is likely in for a tough night. Russell Wilson has a good arm and can move but is not immensely talented. Where he stands out is with his headiness, efficiency, and composure, in an amount unusual for a young quarterback. He’s not the type to get stupid and get his team beat, a key to the success he has had and brought. Back in that ‘11 nightmare, the Saints missed a jillion tackles on running back Marshawn Lynch, producing a highlight reel touchdown run that, besides inevitably will be replayed countless times in the promos for this game, resurrected a then sagging career. For coordinator Rob Ryan, he will have to pick his poison. If Lynch has another big night, it will be bad news for New Orleans. The gut feeling here is to contain Lynch at all costs and challenge Wilson to beat the Saint defense through the air. Percy Harvin and Golden Tate have ability at wide receiver, but there are no Megatrons on their receiving corps. Whomever is playing tight end may be the key one the Saints can’t afford to forget about. It’s being billed as the game of the year so far, and though the Pats and Broncos put on quite a show the other night, we can’t disagree. Oddsmakers have Seattle favored by 8 points, a wide spread considering the sterling records of both teams. Big games like this often turn into blowouts; let us hope the Saints don’t end up on the wrong side of that! Yet a perusal of their season record reveals that the Seahawks have not faced or defeated a team with as classy an offense this season as the one they will see from Brees & Company on Monday night. They did beat the Panthers in the opener and then the Cardinals, but before both began playing well. And no offense to them, but those offenses were not of this octane. New Orleans’ team knows something about playing while hearing the shrieks. 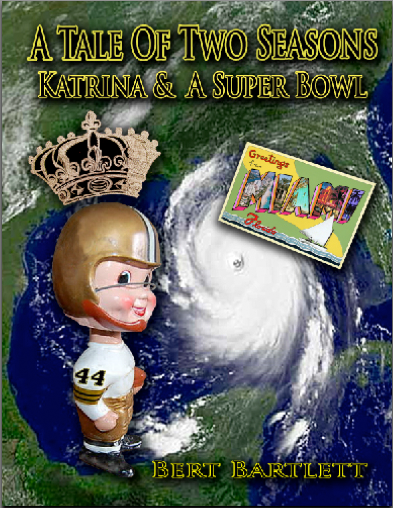 This gives us optimism; indeed, not only that, we’re just nuts enough not only to hope – but to expect – that the Saints will go up there and have enough premium gas to win the damn thing. As usual, Bert captures the essence of the Saints vs their opponents in a way that few sports writers are able to do! Way to go, Bert.